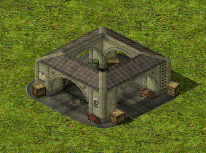 Each side in D-day has a building which acts as the mid-late game tech building, giving you access to tank destroyers & other miscellaneous units, they also have a unique support ability too. Here is a run down of each sides special. The Americans can call a cargo plane to drop supplies around this flare marker. The British get a workshop which can repair vehicles & can also be upgraded to gain access to specialist units. France can utilize their resistance fighters to scout the map & reveal enemy targets. 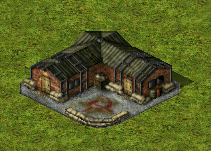 The Soviets get a NKVD Office, which enlists extra infantry (i.e. clones them). Germany get an armory which can be used to train infantry to elite status. 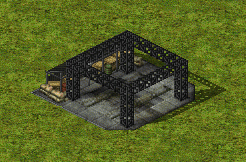 Italy have a salvage yard which can be used to recycle & also backwards engineer any captured units. Japan get a temple which spirituality imbues infantry with the power to slowly heal themselves over time. PS: BTW to keep things balanced all these buildings have a build limit of 1. I think you meant reverse-engineer for Italy's salvage yard, Mig. Backwards engineer sounds a bit odd. And maybe you could use Graion's AttachEffects logic for the other two since your using Ares. 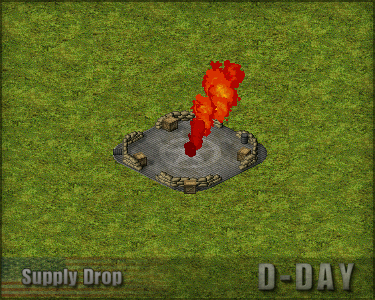 Units pop up in bonus crates quite often, I'm also thinking about giving engineers the ability to hijack vehicles too. Well, I kinda stashed AE since 0.2 enjoys my time of free coding, but yeah, after 0.2, we can deal, since after 0.2, I'll be willing to upload binaries to the unstable server. Back to buildings, they are awesome, and pretty different. US- Give them a building some make them get some parabombs or paratroopers? They get a NVKD Office, which enlists extra infantry (i.e. clones them). The US already get paratroopers & the Fatman nuke as late game superweapons. These are mid game support buildings tho. 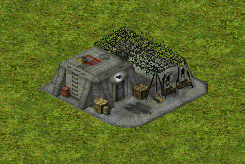 what about a Spy-Sat style building? Perhaps for France, with some resistance reconnaissance? That sounds good The more that I think about it maybe the US should get a supply drop as their special? Do it, otherwise it will be nearly useless. Can probably make him repair units too, OP much? IMN, bug me on the IRC, I know how he did. Maybe not exactly but I too do have a mine layer. Engineer uses a dummy weapon that spawns immobile infantry that look like mines etc. There are repair tanks so engineer repairing isn't really needed I guess, just trying to make him as multifunctional as possible. Should make Engineers a little more common to see in the game, outside of destroyed CYs and APC+engi rushes. Updated the American & French buildings. Because I haven't made it yet, I just updated the description.